Mikhail Kolyada performs his long program at the 2017 Russian National Figure Skating Championships. The 2017 Russian National Championships is underway in Chelyabink, Russia, and the first set of medals awarded was in the Men’s division, which is arguably the weakest discipline in the country right now. However, even though none of the skaters displayed an arsenal of jumps comparable to that of the world’s best skaters at the ISU Grand Prix Final earlier this month, the Russian men definitely took notice and tried to step up their game accordingly. Mikhail Kolyada opened his long program performance with a fully rotated quad Lutz attempt, but fell on the landing. He went on to produce a slightly flawed quad toe loop and the rest of the elements, including two triple Axels, in his entertaining “La reve de la fiancee” and “A la lune” routine was spot on. The student of Valentina Chebotareva picked up 188.15 points for his free, and with 283.48 points in total, won his first national title with 23 points to spare. The quad Lutz is here to stay. When asked about his plans regarding the jump, he promised to go for it at the European Championships in January. Meanwhile, he is looking forward to a New Year break. Alexander Samarin was also up to the challenge. The student of Svetlana Sokolovskaya, who tried two quads in one program for the first time at the Junior Grand Prix Final in Marseille, successfully landed a quad toe loop and quad toe loop-triple toe loop combination in Chelyabinsk. He did not go for a third combination jump, however. The Muscovite double footed the double Axel, the only flaw in otherwise engaging and powerful performance to “Maybe I Maybe You” by the Scorpions. He earned 172.33 points for the free and 259.74 points in total to win his first Senior medal. The skater says that he did not think about qualifying for the 2017 European Championships. However, Samarin still plans to compete at the 2017 Junior World Championships. Defending champion Maxim Kovtun started the event with a shaky short program, in which he failed to execute the planned quad Salchow-triple toe loop combination after a weak landing of the first jump, and later popped his planned quad toe loop into double, receiving zero points for the element. Despite receiving the second highest program component scores of the night, the student of Inna Goncharenko found himself in 7th place after the short program and outside of the final flight for the long. However, he come back strong. The 21-year-old nailed both quads attempts – the Salchow and toe loop – and only made a mistake on a triple loop attempt later in the program, which he opened in the air before completing the rotation. In terms of presentation, his routine to “Iron Sky” was definitely one of the most proficient performances of the night and he picked up 172.72 points for his free program, less than half a point below his winning three-quads free skate at the last year championships (173.14) and 249.37 in total to finish third. The three-time Russian National champion started to work with a psychologist. The fourth place unexpectedly went to Andrei Lazukin. The student of Tatiana Prokofieva also went for two quad toe loops and nearly landed them clean, but he popped the second triple Axel into a single in the second half of the program. He earned 157.81 points for his free and 241.00 points in total. The 2016-2017 Junior Grand Prix Final Champion, Dmitry Aliev, finished fifth. He attempted a quad in the short program for the first time, but popped it into a double, and in the long program, he fell on a triple loop. Sergey Voronov, who stood third after the short program, had an error ridden performance in the long and slipped to seventh place overall (233.62). 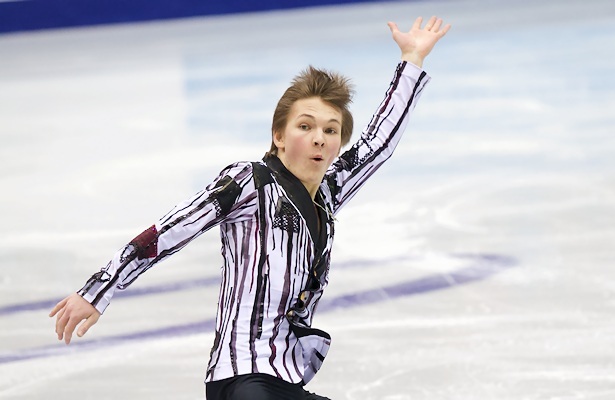 Alexander Petrov, one of the few skaters who did not attempt a quad, finished sixth (236.93).